In the middleweight bracket of the competition, both finalists were from Team Sonnen with Warlley Alves came out on top by choking out teammate Marcio Junior early in the third round. In the heavyweight bracket, Team Wanderlei’s Antonio Carlo Junior got the clear decision win against Team Sonnen’s Vitor Miranda after dominating in both striking and wrestling. Both these fighters have won themselves a six-figure contract with the UFC. In the main event of the evening, Stipe Miocic (12-1) defeated the heavyweight debutant Fabio Maldonado (21-7), I wasn’t following the news but I would suspect Maldonado took up this fight on short notice ’cause he looked completely unprepared and Miocic was supposed to face Junior Dos Santos, who pulled out due to hand injury. 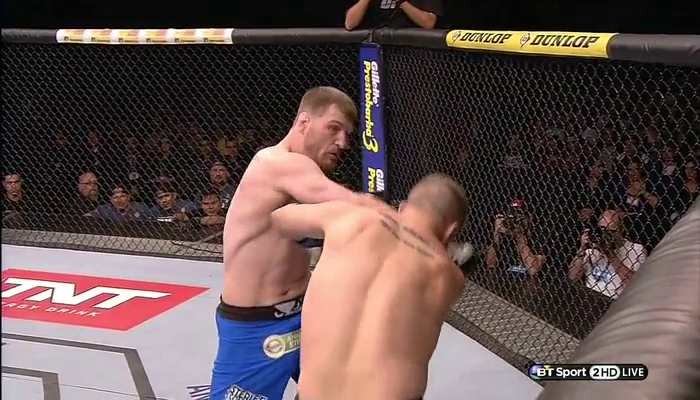 He got caught by Miocic’s punch within seconds and then got dropped by another punch a few more seconds later. Miocic went on top to follow up with some ground and pound and Maldonado didn’t defend himself, forcing the referee to stop the bout in just over a minute in the very first round. Now that was one disappointing main event. In the other event that happened on the same day but in another continent, the fights weren’t as exciting and I think UFC acknowledge it as well, they didn’t award the Fight of the Night honour to any of them. But take nothing away from Gegard Mousasi (35-4-2) and C.B. Dollaway‘s (15-5) impressive win against Mark Munoz (13-5) and Francis Carmont (22-9) respectively. Munoz was able to Mousasi down for a few times but every time he did, he ended up at the bottom. The last one gone straight to a full mount position for Mousasi, who got a rear naked choke in deep when Munoz tried to get back to his feet and he tapped. Dollaway’s dominant performance against the top 10 ranked middleweight fighter Carmont really surprised me. Carmont seemed dangerous with his reach and striking abilities, especially those kicks, but it was Dollaway got the upper hand when his straight punch dropped Carmont in the first round before entirely controlling the wrestling in the other two. Clear decision win for Dollaway. 3 out of the 4 bouts were in the middleweight division but honestly, I didn’t see anyone with championship potential. I hope they prove me wrong.